Back Row (Left to Right): Assistant Coach Jaime San Miguel, Miles Bedford, Ryan Kelley, Dylan Baker, Keath Flint, Aaron Cohen, Assistant Coach Frank Barthel, Brendan Daugherty, Damon Ludwig, Ryan Doogan, Jamie Daniel, Head Coach Steve Bavard. Front Row: James San Miguel, Dominic Holloway, Justin Brooks, Alex Campbell, Lance Ibesate, Alex DeRocher, Vinnie Isturis, and Assistant Coach Matt Thrasher. Seniors(Left to Right): Jamie Daniel, Dominic Holloway, Keath Flint, Alex DeRocher, Dylan Baker, Vinnie Isturis and Aaron Cohen. WHO’S BACK? THE CRIMSON BEARS WERE BACK!!!! 2010, what a year. In route to winning their fourth state title, the Bears were undefeated in 21 games and were led by a powerful offensive attack in which five starters hit over .400, with three of them hitting over .500 and a sixth player hitting .394. 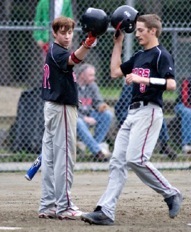 The team’s batting average was .421 with a total of 32 home runs ( 9 home runs in consective days in Ketchikan and against Ketchikan) and the team ERA was 2.00. The combined team Grade Point Average was 3.55, winning the State GPA award. 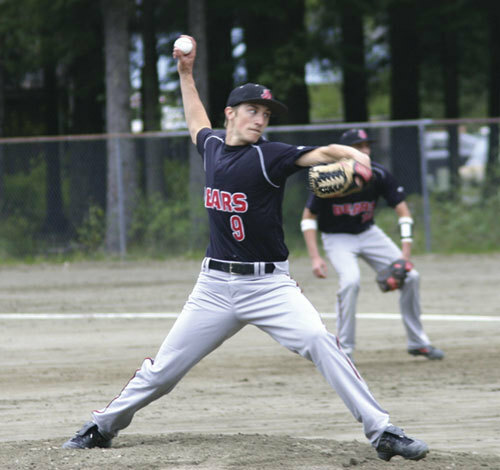 Dylan Baker was named the Alaska Gatorade Player of the Year and the Louisville Slugger player of the year. Baker batted .484 with 11 home runs, 21 runs batted in, and 42 runs scored, while also pacing the Bears with a 6-0 record on the mound. He posted a 1.97 ERA and 63 strikeouts in 32 innings pitched. Vinnie Isturis led the team in batting average, hitting .536 with 8 home runs and 29 runs batted in. Aaron Cohen batted .516 with 7 home runs and a team leading 35 RBI, and Alex DeRocher batted .449 with 2 home runs and 28 runs batted in. Cohen also posted a 5-0 pitching record to go with a 1.29 ERA and 52 strikeouts in 38 innings. Damon Ludwig, went 4-0 with a 2.51 ERA and 18 strikeouts in 22 1/3 innings of work. In 21 games the Bears scored 228 runs, (10.9 runs per game), holding their opponents to just 47 on the year, (2.2 runs per game.) They batted .421 as a team while their pitching staff held their opponents to a .164 Batting average to go with a 2.00 ERA. Baker, Cohen, DeRocher, and Keath Flint were all named to the All-Conference Tournament team, while Baker, Cohen and Isturis were named to the All-State Tournament roster. Damon Ludwig was named player of the game in the state championship game. A new team joined the Southeast Region V league. After several votes a majority of those who voted in Juneau decided that the town and students needed a second high school. Thunder Mountain High School opened its doors for students. In its first year of baseball TMHS did not fare well but will improve each year. 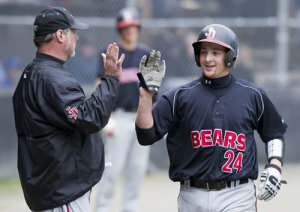 Aaron Cohen gets a high-five from Manager Steve Bavard after hitting a two-run homer against TMHS. Vinnie Istruis scores against Kechikan. Dylan Baker delivers a pitch. 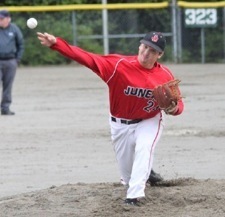 Aaron Cohen delivers a pitch against Sitka. 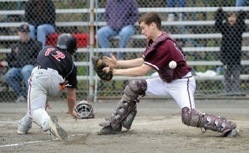 Brendan Daugherty gets out of the way of a pitch against Thunder Mountain. 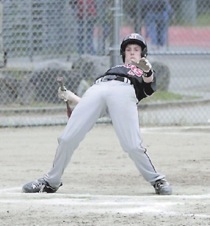 Miles Bedford delivers against Kodiak. 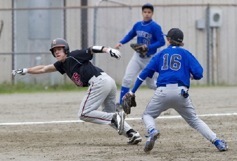 Justin Brooks tries to avoid being caught in a rundown against Thunder Mountain. 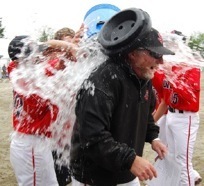 Manager Steve Bavard gets a customary cooler shower after the team won the Southeast Conference Tournament. 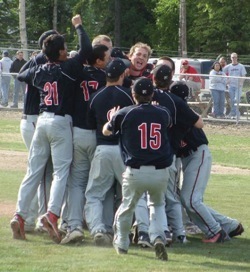 The team celebrates their 9-7 victory over Dimond in the state championship game. NOTE: Individual batting ststistics listed below are based on players with at least 34 at bats. The better hitters have batting average of .300 or higher. However some hitters may hit lower than .300 but hit more timely hits than hitters with higher batting averages, for example hit when runners are on base or in scoring position (a runner on 2nd or 3rd) or hit to keep a rally going. On Base % = (H+BB+HP) / (AB+BB+HP+SF) (BB=Base on Balls) (HP=Hit by a pitch) (SF= Sacrifice Fly Out). Five other Crimson Bears had an On Base % over .400. (The career highest OB% in the Majors belongs to Ted Williams at .482). Two other Crimson Bears had slugging percentages in the .500 to .700 range. career highest Slugging % is held by Babe Ruth at .690). .300 or better are in the 90% range) (source: Ron Shandler USA Today 4/17/2008). ERA= (ER x 7) / IP (Earned Runs x 7innings (in high school baseball) divided (/) by Innings Pitched). 0.00 and his WHIP is ( 2 BB + 1 H / 6 innings pitch) = .600. Pitcher B could give up no runs 7 hits and issue 3 walks. His ERA is 0.00 and his WHIP is (3 + 7 / 6) = 1.66. A good WHIP is around 1.00 below that is excellant. A poor WHIP is 1.75 or higher. In our example Pitcher B is allowing nearly 2 runners per inning. If a pitcher continues on that path, trouble ahead. 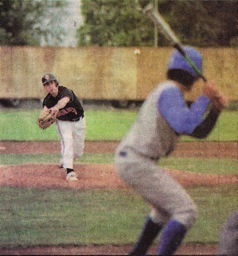 Here Pitcher B most likely had solid defense behind him or he struck out batters thereby pitching a shtutout.